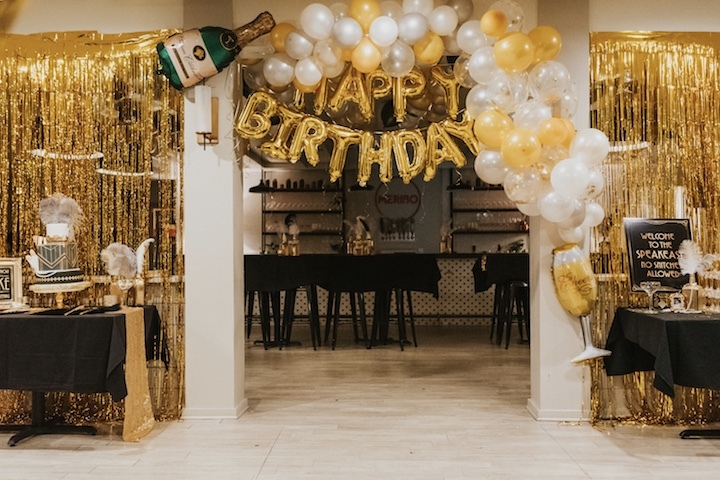 Hey everyone, as promised, today I’m sharing all of the decoration details from Blake’s 30th birthday party. 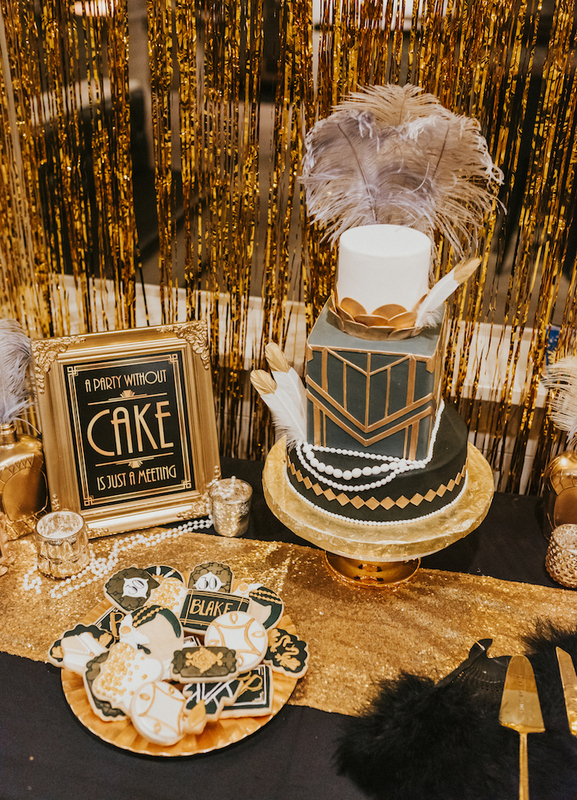 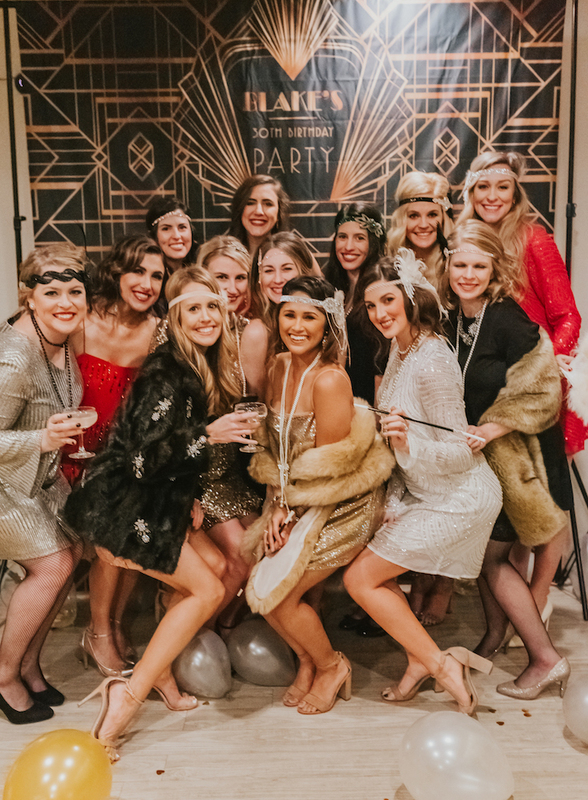 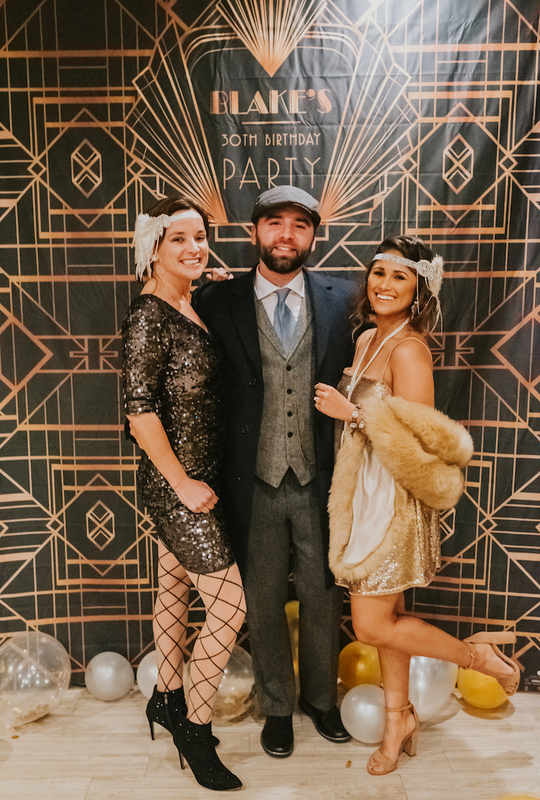 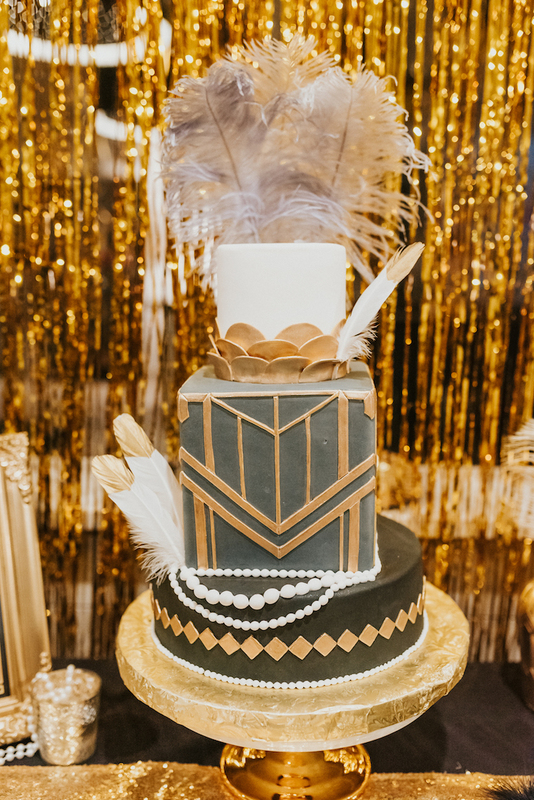 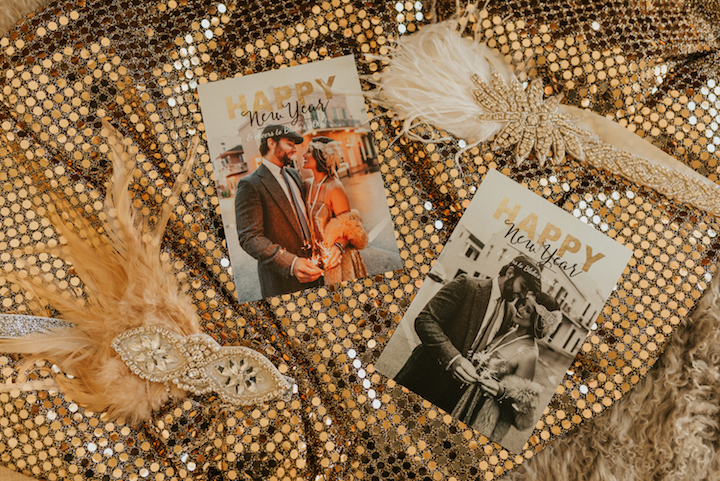 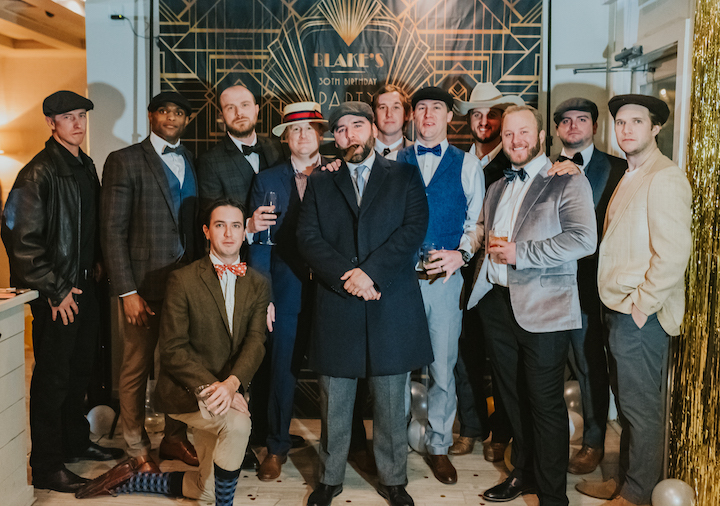 This was our first year planning a themed birthday party and we thought it would be fun to choose a 1920s theme to help him say so long to his 20s and hello to 30! 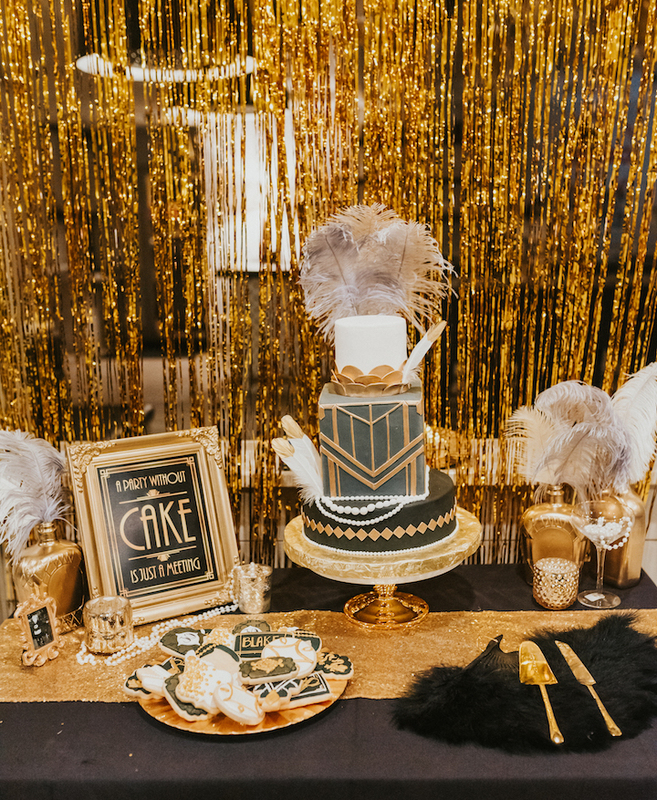 We ended up going with the Great Gatsby theme because “a little party never killed nobody,” right? 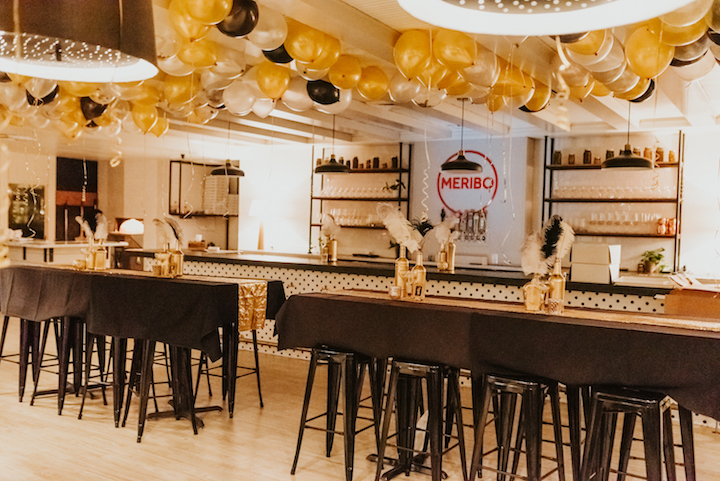 To plan the perfect party, I created a spread sheet in google docs and shared it with Meribo, my two assistants and my best friend so everyone would be on the same page. 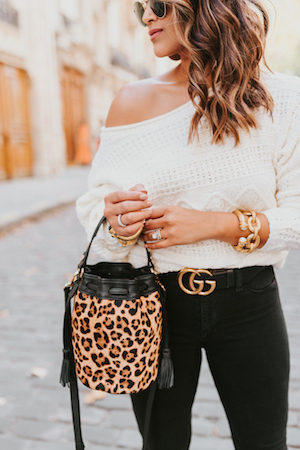 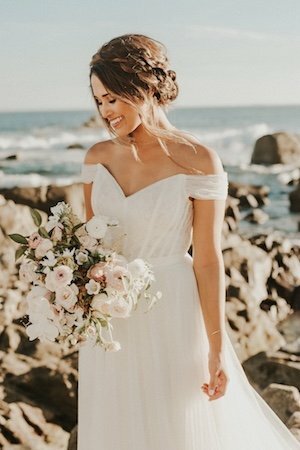 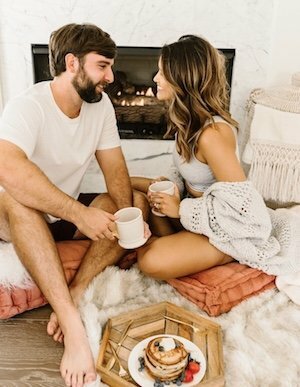 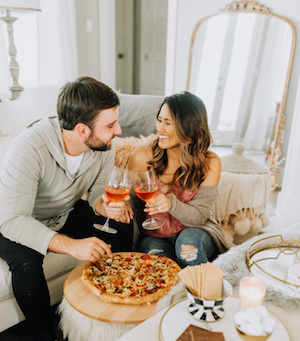 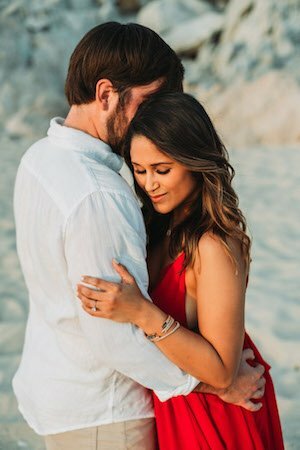 I put together an extremely detailed list with descriptions of how each table and area should look and we met at the location the day before the event for walk through. 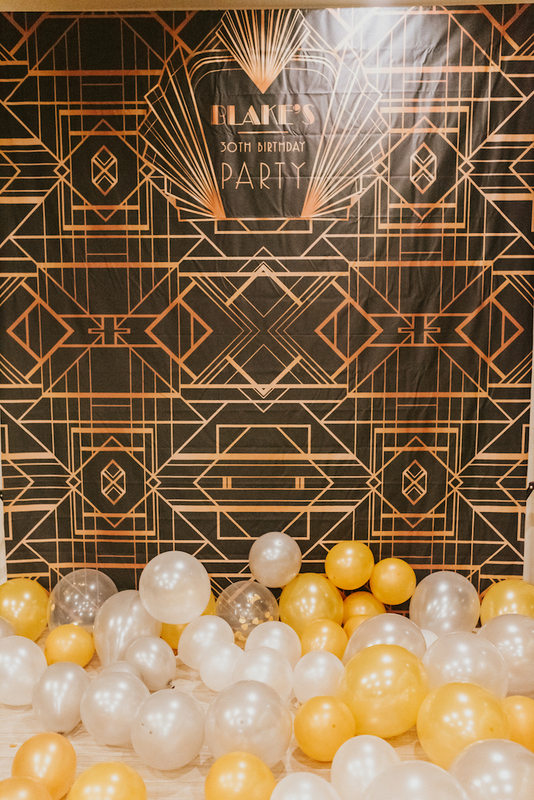 I even made a detailed schedule for all five of us so that everything would be finished in time for the party and I found that it helped the whole decor process run very smoothly. 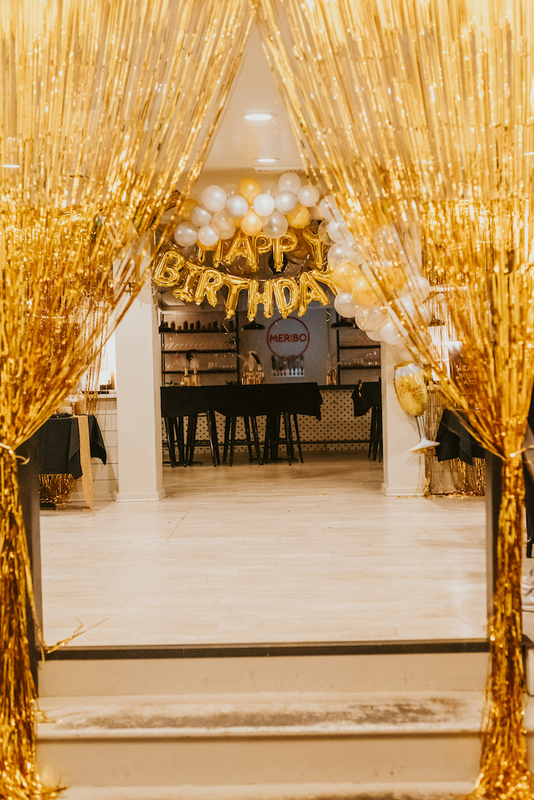 The best part about hosting the party at a restaurant is not having to worry about catering. 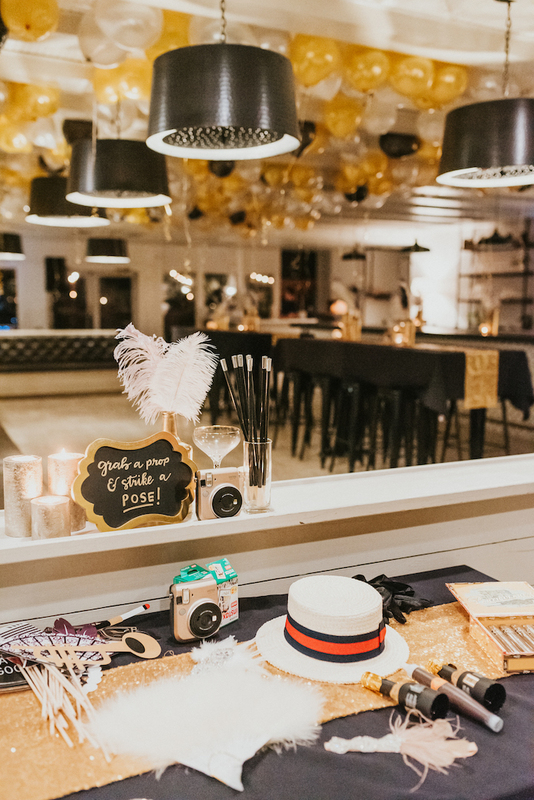 They took care of everything and did a pizza bar and served delicious pastas and hors d’oeuvres. 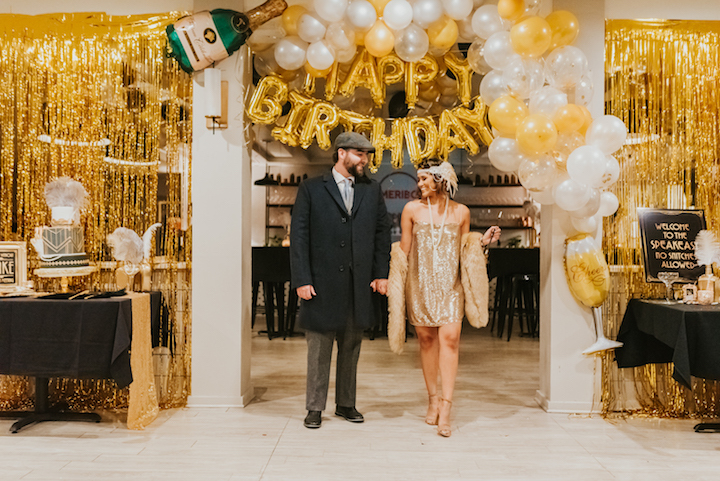 Happy Birthday Balloons with Champagne & Glass Balloon | Gold Sequin Table Runners | Silver Ostrich feathers | Gold Confetti Balloons | White Ostrich Feathers | Gold Foil Curtains | Gold, Black & White Balloons | Pearlescent Gold Balloons | Plastic Champagne Glasses for champagne tower | We rented all of the black table cloths through Meribo and we also rented a helium tank from Wesco to blow up all of the balloons. 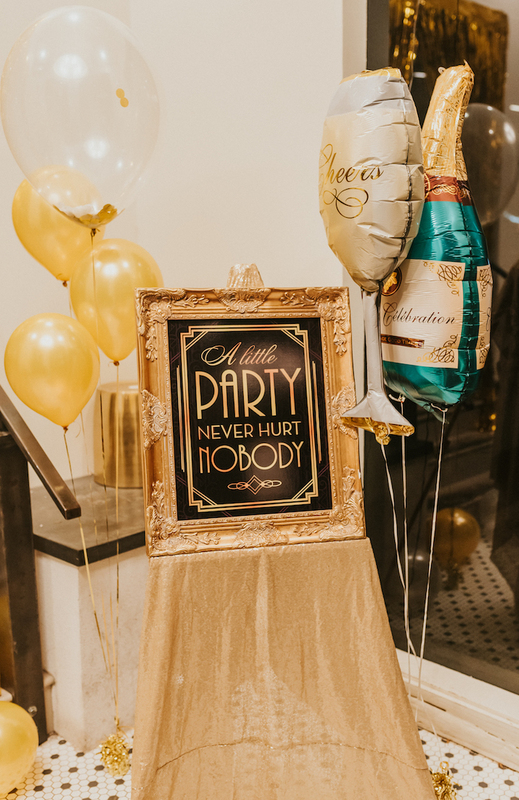 For the photo photo booth table sign, I bought a small gold framed chalkboard from Hobby Lobby and wrote on it in gold paint pen. 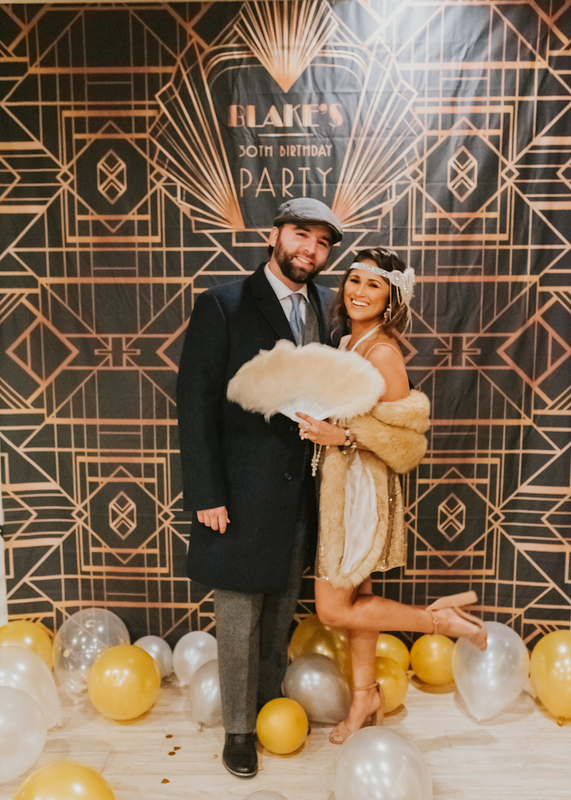 | Great Gatsby Custom Photo Booth Backdrop | “Welcome to the speakeasy” sign | Outdoor Party Sign | “A party without cake is just a meeting” sign | Dollfaces & Old Sports bathroom signs | A Little Party Never Hurt Nobody Sign (To make the sign, I ordered the PDF from Etsy and then had it printed onto foam board at a local print shop. 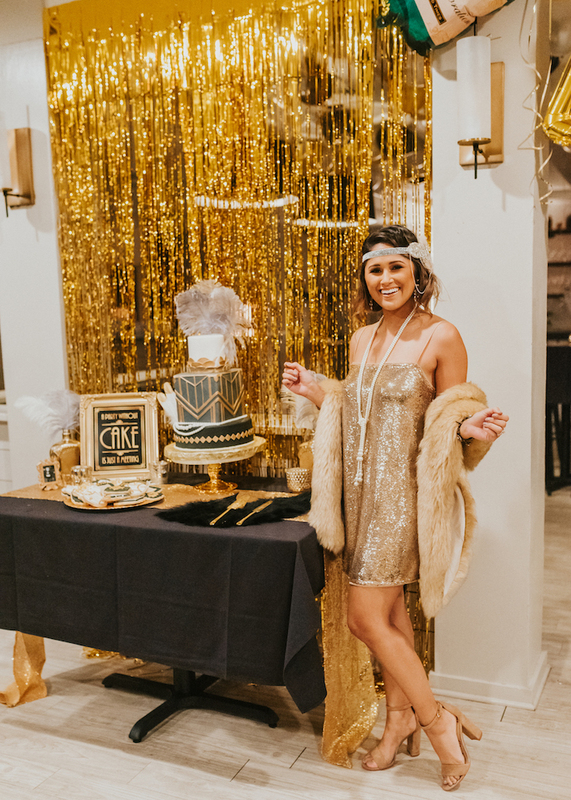 Then I found a large 16 x 20 golf frame from Hobby Lobby and placed the foam board inside of it and then set it into a wooden easel covered with a gold sequin table cloth. 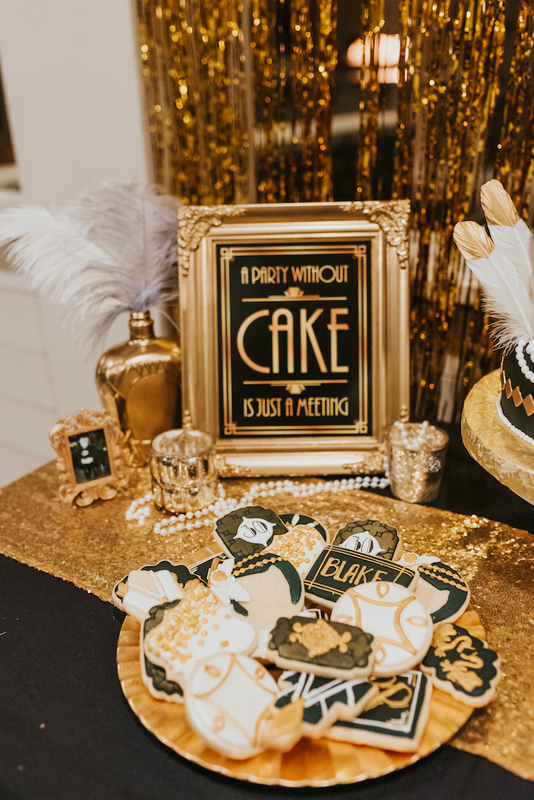 I did same thing with the cake sign except I had to spray paint the frame gold to keep with the theme. 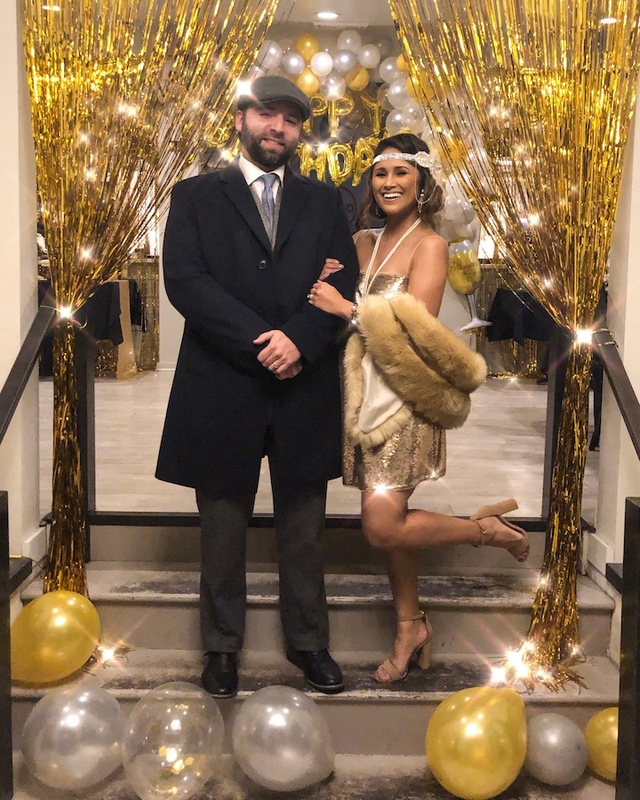 I also framed a black and white photo of me and Blake in our costumes for a cool vintage look. 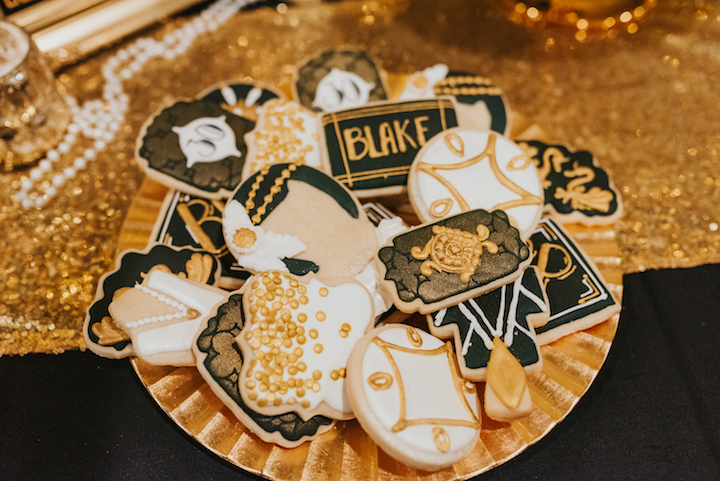 I even bought mini gold frames for black and white wallet sized photos of Blake as a baby for the centerpieces. 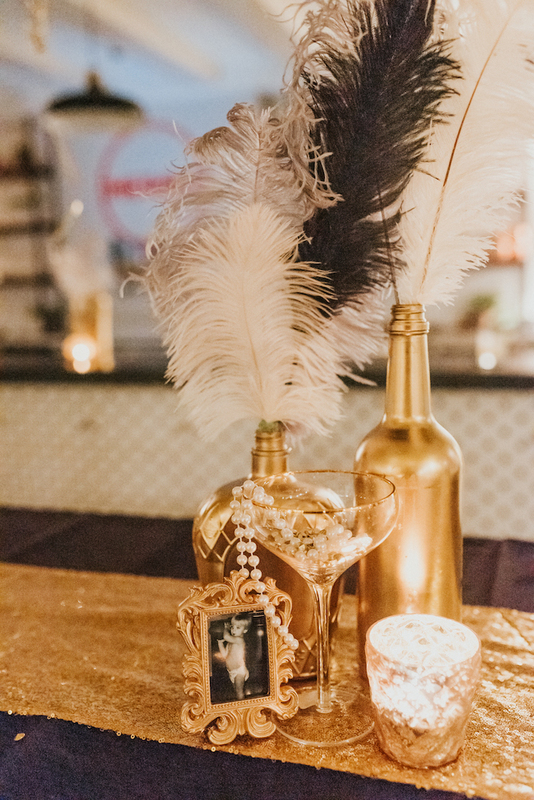 For the centerpieces, we spray painted 20 liqueur bottles metallic gold and stuffed a small piece of floral styrofoam in the opening to the hold the ostrich feathers up. 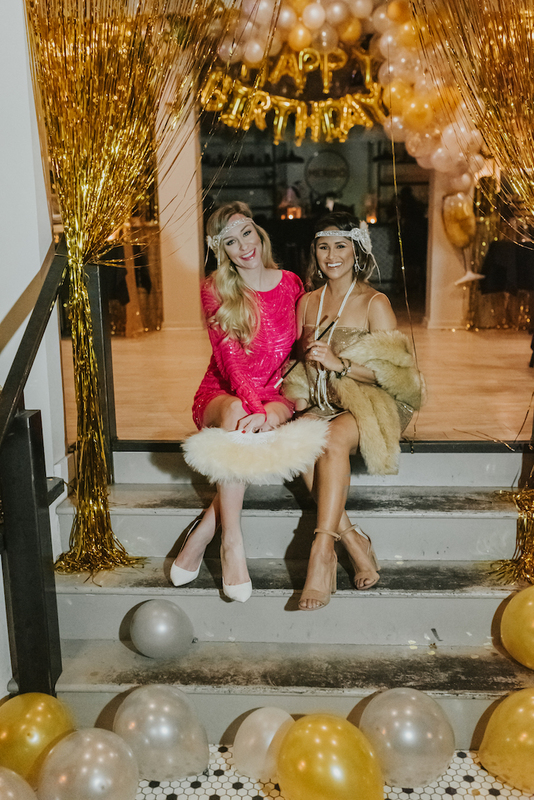 I found a variety of different ostrich feathers at Hobby Lobby and on Amazon and Etsy. 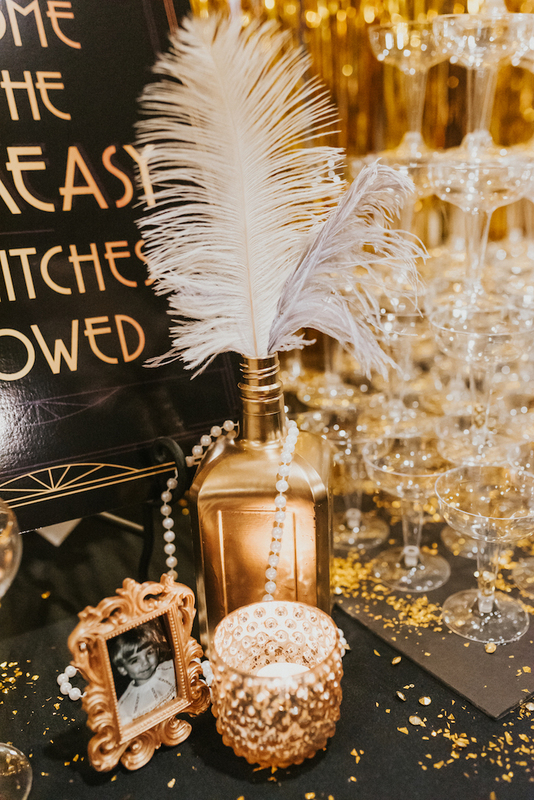 To complete the center pieces, we filled coup cocktail glasses with gold beads and strings of pearls and placed them next the gold liqueur bottles along with mercury glasses candle holders. 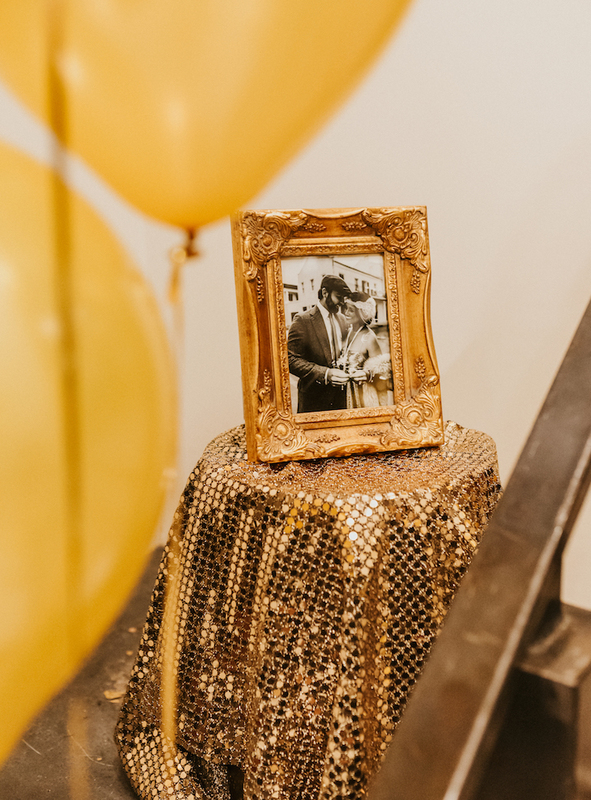 We also added gold framed black and white photos of Blake as a baby for a few of the main centerpieces. 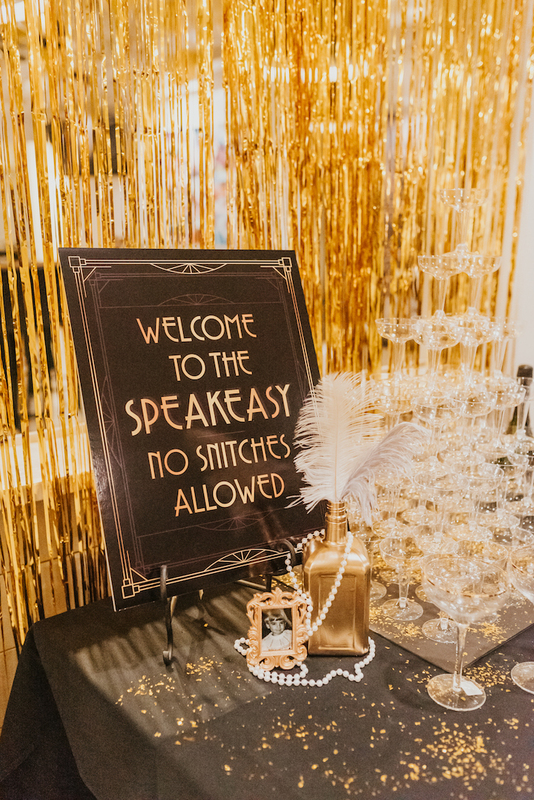 “Welcome to the speakeasy” sign | For the champagne tower, we ordered plastic champagne glasses from Amazon and hot glued them down to a foam board covered in gold glitter for a fun display. 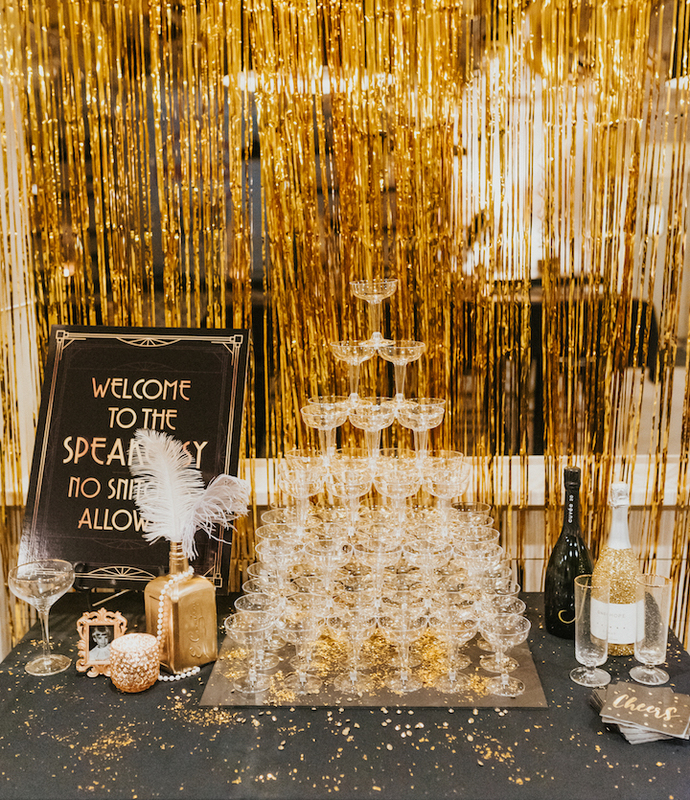 Don’t worry, we made sure to provide our guests with plenty of real champagne glasses filled with bubbles! 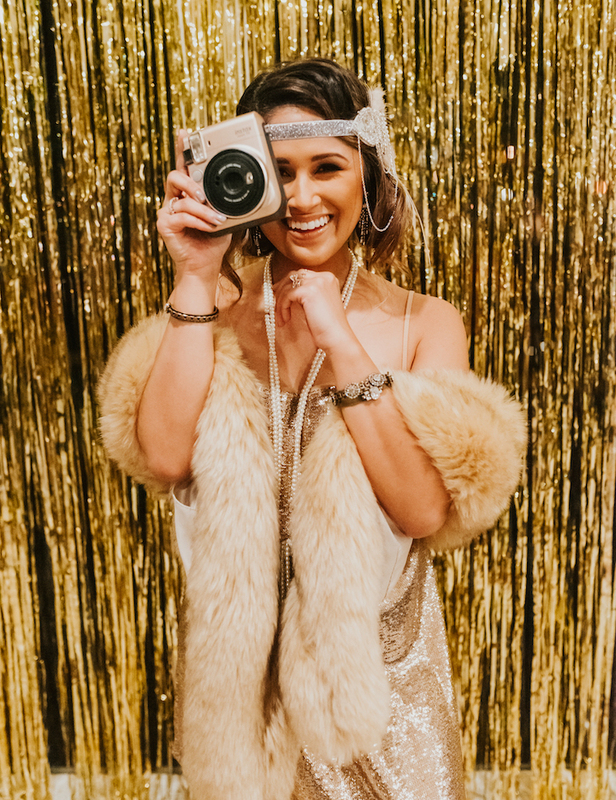 Find my Instax camera here! 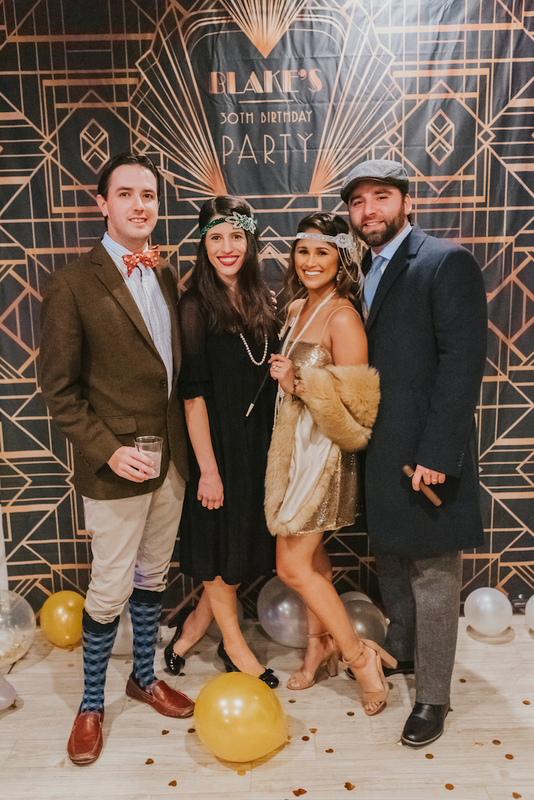 Thanks so much to Haley, Marnee and Cami for helping me make this party possible!